Soft and conventional colors,light blue ，deep blue,Light purple and purple and yellow, make it easy to notice and not miss. QUANTITY: 3 x 3 inches,10 Pads/Pack,100 Sheets/Pad,1000 Sheets Total. We already improved the sticky issue. Now it sticks very well. SUPER QUALITY: High quality paper, easy to use and peel,there will be no residue after tearing, can keep clean and tidy. 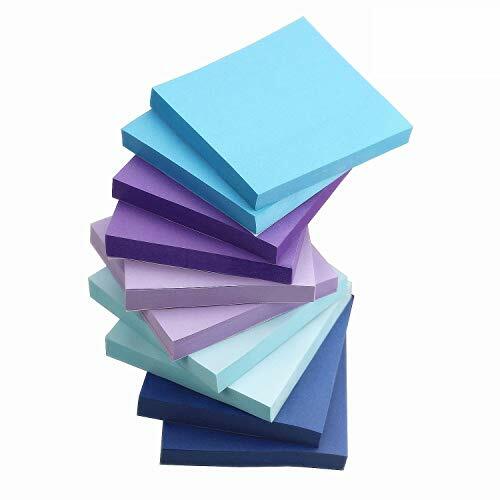 APPLICATIONS: Sticky note suitable for school, office, family, sticks to practically any surface, our Sticky Notes allow you to stick notes virtually anywhere: Fridge, Desk, Wall, Metal, Wood, Plastic and all clean smooth surfaces. EASY TO USE: Paper texture, easy to write down your message, easy to stick, easy for you to record important things, eye-catching colors are ideal to catch the attention so you will not ignore message for all your to-do lists and reminders, perfect to keep your thoughts in-sync. INDIVIDUALLY PACKAGE: Separate packaging,each sticky note has an independent bag,keep it clean and tidy,easy to carry and store. If you have any questions about this product by ZZTX, contact us by completing and submitting the form below. If you are looking for a specif part number, please include it with your message.